It’s All Greek to… | "It's All Greek to YOU!" 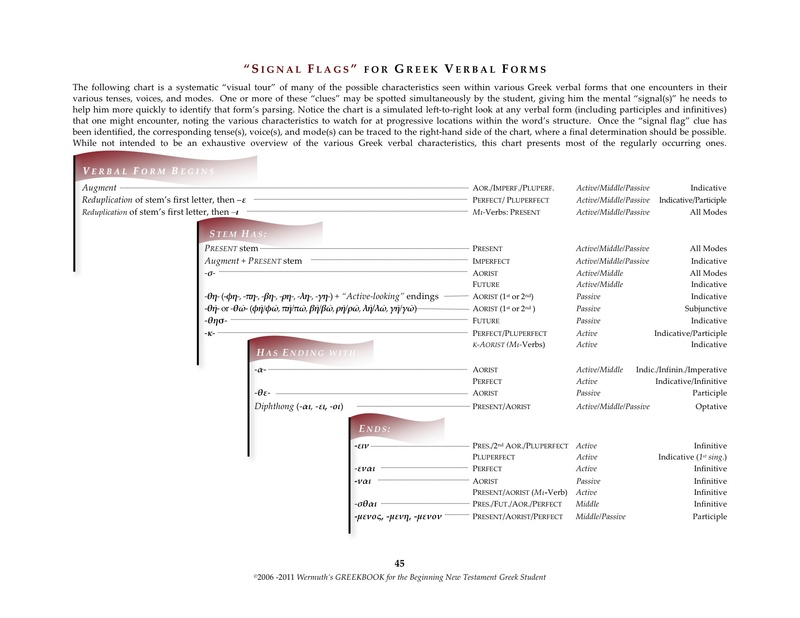 The following Greek Nouns Declensions chart, available here as a downloadable PowerPoint presentation and here as a downloadable PDF, details all of the types and genders of nouns that the New Testament Greek student will encounter. 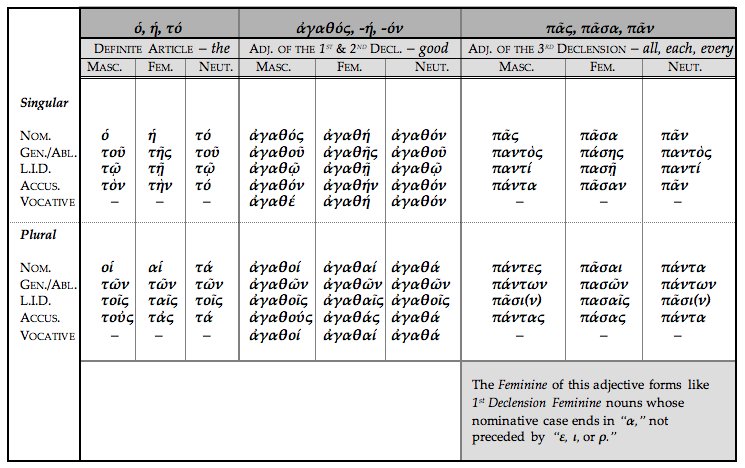 I know of no other paradigm in existence that condenses all of these case endings—based on the “8-case” paradigm—into a single, concise chart of all Greek noun declensions. I call it the “satellite view” of all Greek noun endings. 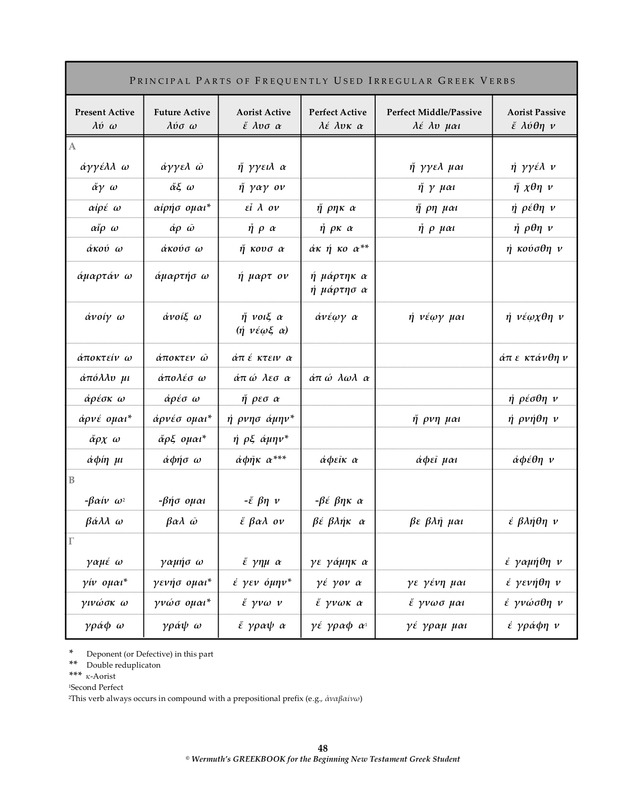 Of significant value are the horizontal relationships existing between each type of noun presented in a vertical layout that can be clearly observed in this comprehensive, single-page layout. Assisting in your memorization of these endings are the use of arrows showing either identical or similar continuity, and yellow highlights denoting pattern shifts. 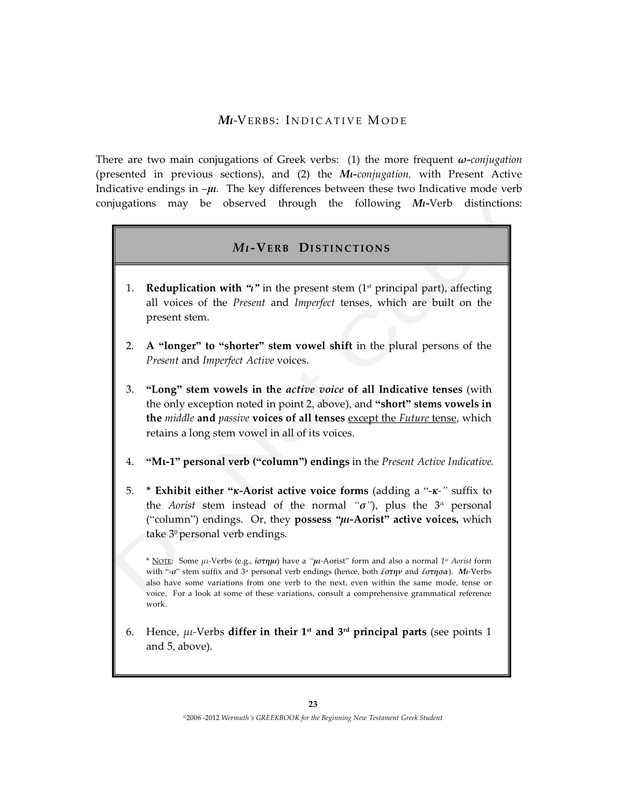 * NΟΤΕ: The PowerPoint presentation also includes an overview of the “8-case” system, as well as a static view of the declension and translation of the 2nd declension masculine noun λόγος. It’s also noteworthy that Neuter nouns (pronouns, adjectives) always repeat their nominative endings in the accusative case (singular and plural, respectively). 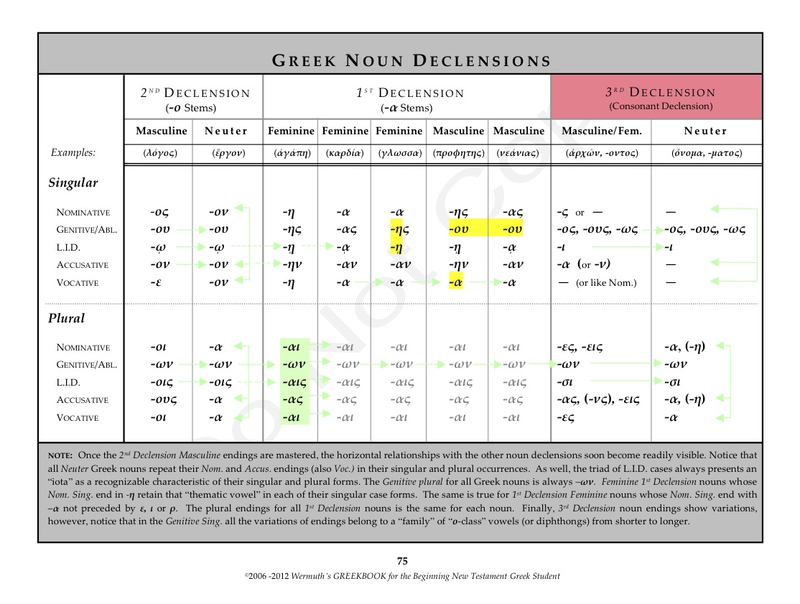 There are various types of Greek nouns declined in the 3rd Declension, also called the “Consonant Declension.” These types derive their names based on the final letter(s) of their respective stems. Stems in this declension are not readily identifiable by referring to their Nominative singular (lexical) forms, but rather (usually) from their Genitive singular forms. It is helpful, therefore, for the student to memorize the Genitive singular stems of these types of “irregular” Greek nouns. For more on this click here. The following PDF contains all the New Testament Greek Vocabulary in W.H. Davis’ Beginner’s Grammar of the Greek New Testament. Listed in textbook appearance order, this textbook-inclusive itemization of New Testament Greek vocabulary is accompanied by a numerical conflation of Sake Kubo’s A Reader’s Greek-English Lexicon words used more than 50 times and Bruce Metzger’s Lexical Aids for Students of New Testament Greek words used from 10 times all the way up to 46-49 times. Click here to open the *PDF. 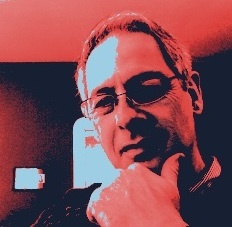 For an online study of the same vocabulary categorized into manageable Davis lesson order groups click here to go to Cram.com (formerly FlashcardExchange.com). Even at the very beginning of your Greek experience, things don’t have to be ominously difficult. Take the Greek alphabet (PDF or PowerPoint download) for instance, the lower case letters in particular. 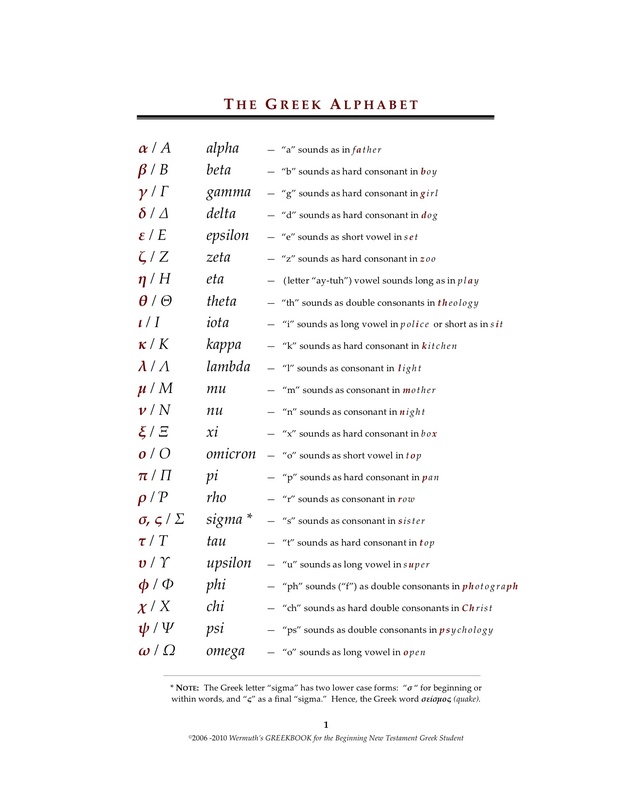 From the outset it is readily observable just how many of the lower case Greek letters resemble corresponding letters from the English alphabet. Notice English similarities to the alpha, beta, delta, epsilon, iota, kappa, omicron, sigma, tau, and upsilon. Even the zeta can be easily recognized as corresponding to the English “z.” And, pi we have become comfortable with as a mathematical symbol. These 12 Greek letters are half of the alphabet! As for the more “difficult” Greek letters, there are ways to correctly recognize and remember many of them quite early on in one’s studies. For example, look at the Greek lambda, corresponding to the cursive English “ l. ” Simply remove the upper loop from the English letter and you have the Greek lambda (i.e., l = λ). Similarly, with the gamma, removing the loop from the head of the English cursive “g ” leaves its Greek equivalent ( γ with a loop in its tail ). The Greek mu, nu and rho can also been seen as corresponding to the English “m,” “n” and “r” if one only adds a little information in the “mind’s eye.” Even the Greek omega (ω) looks, humorously, like a infant’s bottom when one shockingly discovers he needs a diaper change. The exclamation, “Ohhhhh” can be heard all across the room! And that is exactly what the omega represents in English: a long “o.” All together this encompasses 18 of the 24 Greek alphabet’s letters. The remaining six can be learned with limited difficulty through frequent encounters with them within the spelling of various Greek words. An a online animated Greek alphabet tutorial link can be accessed here. 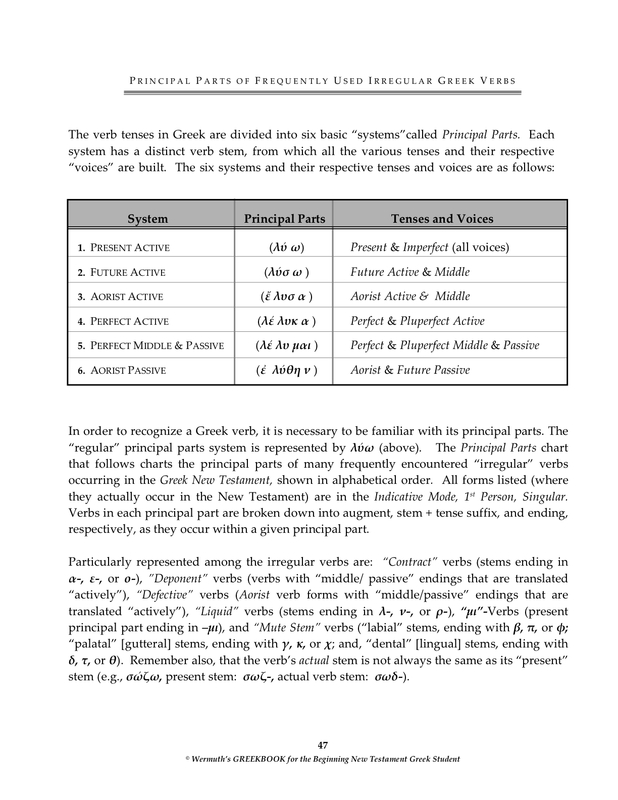 The following chart is a systematic “visual tour” of many of the possible characteristics seen within various Greek verbal forms one encounters in their various tenses, voices, and modes. One or more of these “clues” may be spotted simultaneously by the student, giving him the mental “signal(s)” he needs to help him more quickly to identify that form’s parsing. 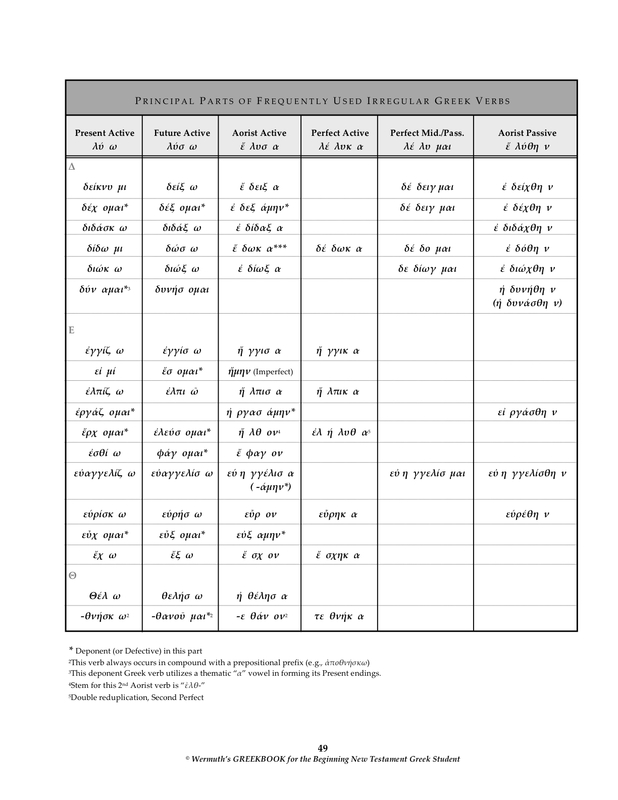 Notice that the chart is a simulated left-to-right look at any verbal form (including participles and infinitives) that one might encounter, noting the various characteristics to watch for at progressive locations within the word’s structure. 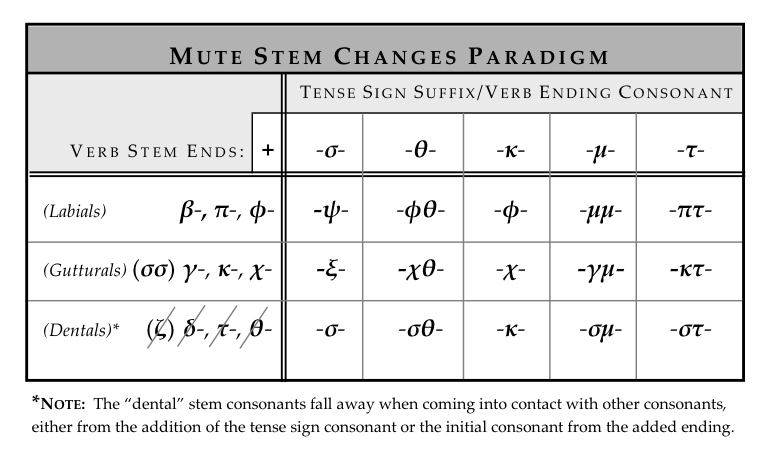 Once the “signal flag” clue has been identified, the corresponding tense(s), voice(s), and mode(s) can be traced to the right-hand side of the chart, where a final determination should be possible. While not intended to be an exhaustive overview of the various Greek verbal characteristics, this chart presents most of the regularly occurring ones. A downloadable PDF is also available anytime from the sidebar of this blog. There’s a famous older expression from another generation, even another millenium now, regarding “…calling a ‘horse’ a ‘horse,'” which basically means identifying something for what it really is. In the realm of personal character traits, this might mean simply being honest with yourself and/or others. In the realm of language and grammatical terminology, it may have some meaning application as well. 1. It reminds the Greek student that he’s looking at a specific category of Greek verbs (Deponent). 2. It reminds the Greek student not to translate these verbs as middle or passive, since they are neither. By “calling a ‘horse’ a ‘horse'” and identifying deponent verbs for what they really are, the Greek student will readily recognize and accurately translate these verb with an active voice translation. Remember, too, that some Greek verbs (like ἔρχομαι) may be deponent in one or more tenses or modes without being deponent in all. [Example: ἤλθον = Aorist/Active/Indicative/1st person, singular/3rd person, plural.] Other “deponent” verbs frequently encountered include: βούλομαι (I am wishing), and πορεύομαι (I am proceeding).